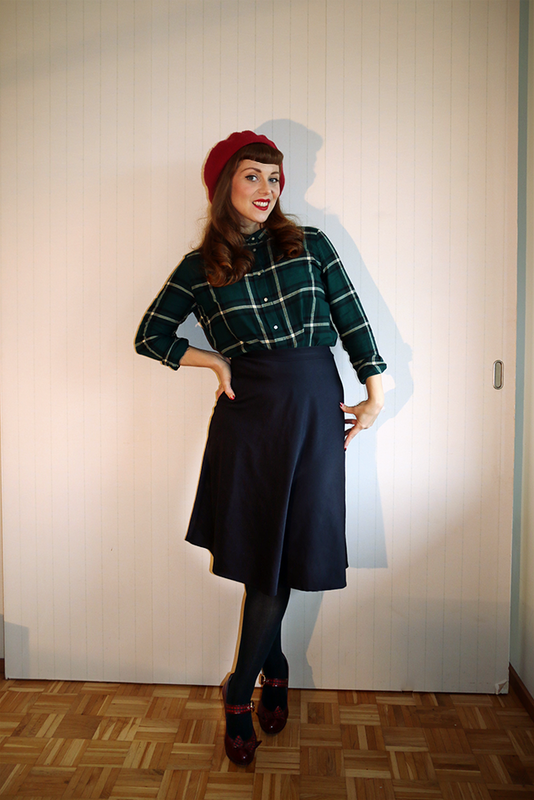 The Freelancer's Fashionblog: A SWEATPANTS SKIRT AND... MORE CHECKS! I made myself a skirt out of a soft and stretchy sweatpants fabric that probably was meant for sport gear or so as it has a somewhat shiny surface. Well, shiny surface = fancy skirt so this is one of those 'HAH! I fooled the universe'-pieces of clothing. Or, almost, because then the universe fooled me a little bit by making me lazy and putting in an elastic waist band instead of a zipper & hook/button fastening when in fact I did not cut the skirt with that much extra to make it easily pulled over my hip . So it is not so comfy to get into but comfy once it's on. I figured as I only have to squeeze twice per day to get in and out of it, or perhaps four times if I got to the gym, I can live with it. The skirt is cut in something between a half circle and a 3/4 circle skirt. The shoes are old Minna Parikka's and yes, I am wearing checks again because that is clearly the theme for this autumn!